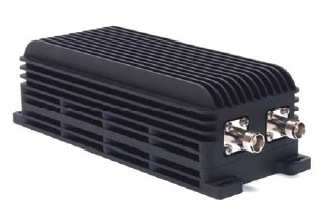 The amplifier includes Voltage Spike Suppression, RF sensing, T/R switching, Automatic Level Control (ALC), six automatically switched harmonic filter bands (DAMA/IWcapable), and protection against antenna mismatch and over-temperature. Protection against accidental polarity reversal is also provided. Low current on standby due to “sleep mode” greatly extends battery life in field use. The amplifier comprises a rugged submersible2-piece aluminum case.